A lot of times, my motto is less is more. But not with this cake. The motto for this cake is MORE is MORE! Which is perfect for 4th of July, and hence why I am calling it the 4th of July firework cake, because it reminds me of a firework. Just all the red, white, and blue, all over the place. Wilton Cakes was kind enough to send me one of their new cake decorating kits and I had so much fun coming up with this cake which was inspired by a few of the various cake designs they had in their book. I decided to cover the entire sides of the cake in red, white, and blue sprinkles and then cover the top of the cake in red, white, and blue buttercream stars and rosettes. Other than the sprinkles, frosting, and food coloring, which I already had on hand, everything I used to decorate the cake came with the How to Decorate Cakes and Desserts Kit which made it incredibly easy to make! 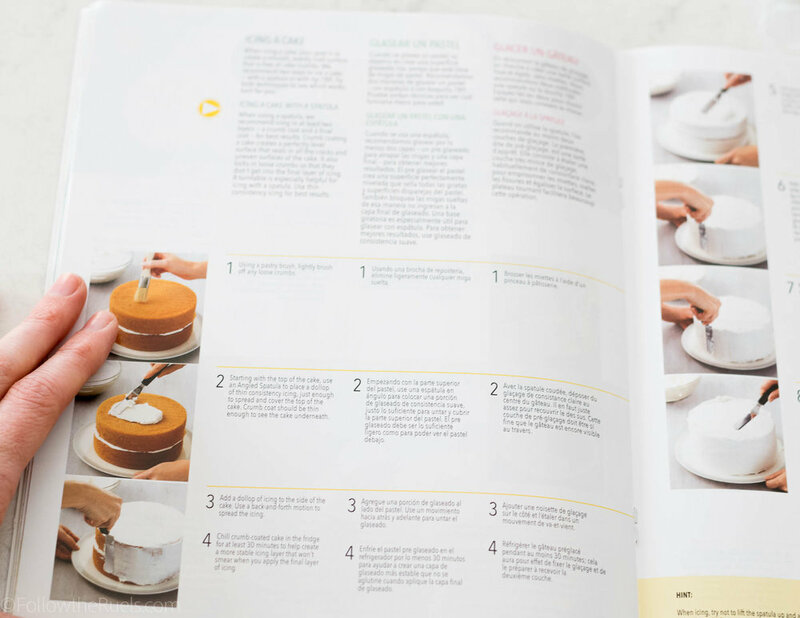 As I mentioned above, I used the How to Decorate Cakes and Desserts kit, which comes with an awesome instruction and inspiration book (below) and all the supplies you will need to decorate your cake. 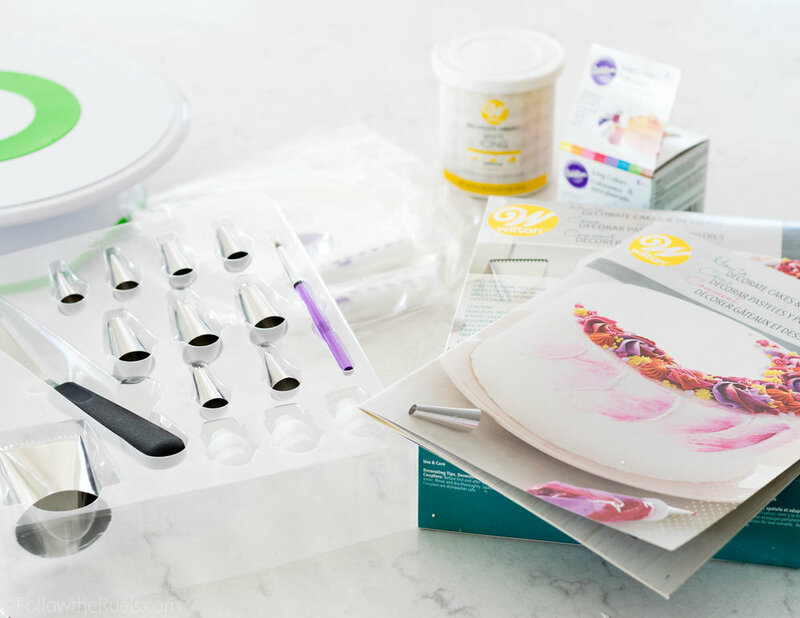 The kit also comes with 10 piping tips, 3 couplers, a spatula, decorating brush, and 24 piping bags in two different sizes. I also used their tiltable turntable, gel food coloring, and white buttercream icing. The instruction book shows you everything from how to bake your cake, cut your cake, layer your cake, and frost your cake. Since I am still learning how to decorate cakes, a lot of their instruction was very helpful. Since the theme for this cake is "more is more" I added these red, white, and blue non-pareliels to give it a marbled funfetti look. If you want a true funfetti look, I recommend using jimmies instead of nonpareils. I used a box cake mix for this cake to make things easy on myself. You can see my tips for making a boxed cake mix taste homemade here. The cake is made up of two layers baked in a 6" cake pan. For a larger cake, double the amount of batter and bake it in an 8" or 9" cake pan. Once the cake is baked, cooled, and leveled, spread the buttercream icing over the first layer. Top with the second layer of cake and another layer of icing, this time spreading it around the entire cake to seal in the crumbs. After the crumb coat has chilled, spoon the buttercream into a large piping bag fitted with the specialty tip 789. Pipe the buttercream around the sides of the cake so that there is a nice thick layer of icing. Use the off-set spatula to spread the icing around the cake. It doesn't have to be pretty, because the sides will be covered with sprinkles. 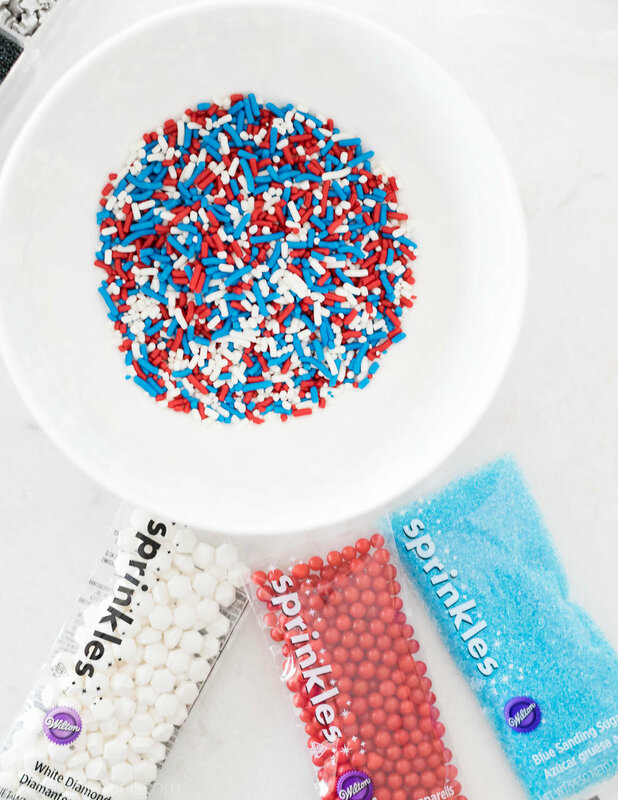 Speaking of sprinkles, mix together all the red, white, and blue sprinkles you can get your hands on. I like mixing together jimmies with some larger round sprinkles and sanding sugars. I also through in a few novelty sprinkles. To cover the sides of the cake, place the cake in the center of a baking sheet covered with parchment. Pat the sprinkles all around the sides of the cake. 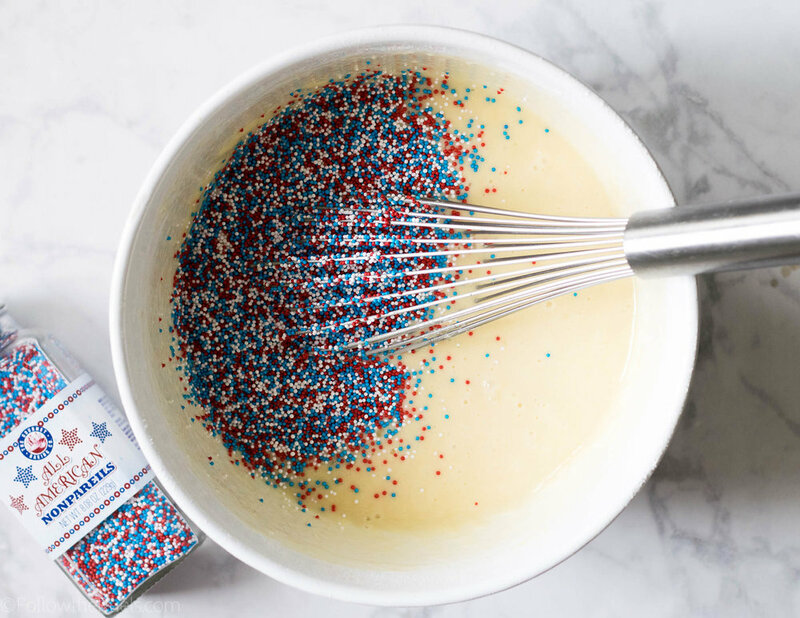 Reuse any extra sprinkles that have fallen away. Finally, prepare the piping bags to decorate the top of the cake. For the larger piping tips (2D and 1M) mix together red, white, and blue icing by spreading lines of icing on a sheet of plastic wrap. Roll the plastic wrap into a tube, then feed the tube into the piping bag with the piping tip inside. You made need to cut off any excess plastic wrap so the icing flows through. Then prepare three other piping bags, all fitted with a coupler and a smaller piping tip. Fill each one with a different color. Start by piping the larger stars and rosettes first. Then fill in with the smaller decorations. Don't be afraid to layer them on top of one another. Also feel free to change out the piping tips using the couplers to get lots of various shapes. Once you are done, sprinkle a few sprinkles right on top. And viola! 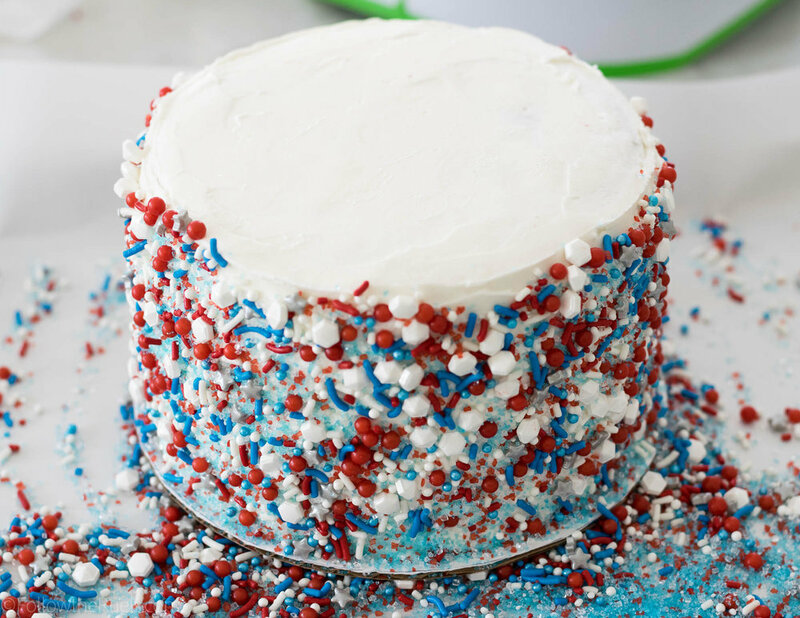 Your very own super patriotic cake! Perfect for 4th of July! Follow my How to Make Boxed Cake Mix Taste Homemade tutorial for an easy semi-homemade cake. Or I highly recommend my vanilla cupcake recipe, which will make 1 6" round two layer cake. Double to make a larger cake.